Design Thinking Ireland 2018 – time to meet the speakers! It’s time to book! 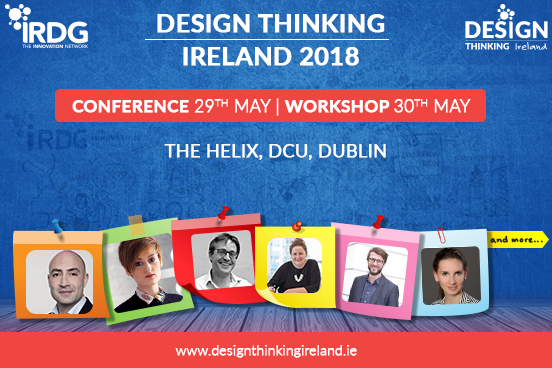 With less than 2 weeks to go to Design Thinking Ireland 2018, the Service Design Workshop is almost sold out (only 6 places remain) and the Conference is filling fast. With a capacity limit on the Conference it’s vital to book early if you are planning on attending! Who? This talented group of people pictured above, along with other design thinking professionals, will challenge your thinking, inspire you by their experiences, share real practical takeaways that you can apply, and provide you with perspectives from outside your own zone. Why Design Thinking? Design Thinking is applicable across public and private sectors, for those innovating around products, processes and services. This is because it focuses on developing deep empathy for customers and end-users, creating solutions that will match their needs as opposed to just dreaming up and delivering a solution for solution’s sake. According to a recent PwC global study, the collaborative and multi-disciplinary approach used in Design Thinking is now being used by almost 60% of companies to drive innovation. On 30th May, a separate dedicated Service Design Workshop will be a hands-on learning experience for everyone who wants to get an interactive introduction to the area of service design. You can choose to attend the Conference, the Workshop, or both. Visit here for details on the agenda & speakers at Design Thinking Ireland 2018 and to book your place.